2001 major areas of petroleum-industry activity in Utah. Utah’s petroleum industry logged one of its busiest years in 2001. The Utah Division of Oil, Gas and Mining approved an all-time high of 880 Applications to Drill (APDs), a 31 percent increase over 2000’s 673 permits. Most of these APDs were for wells in the Uinta Basin (709) and the east-central coalbed gas area (134). Two areas receiving less attention were the Paradox Basin (17 APDs) and the Thrust Belt area (17 APDs). Overall, APDs were approved for drilling in 14 of Utah’s 29 counties. For the period 1980 through 2001, the number of approved APDs ranged from a high of 880 in 2001 to a low of 97 in 1989. The average number of APDs approved over the past five years is 615. Looking at the number of sites where drilling actually began (spudded) shows that 2001 was the busiest year on record with a total of 617 wells. Drilling at those sites resulted in 580 wells completed or abandoned, a 30 percent increase over the 440 wells drilled in 2000. The number of wells completed in 2001 included 399 new wells within existing fields, 163 wells extending the boundaries of fields, and 18 wildcat wells. A closer look at the 580 wells completed shows that 444 were completed as gas wells, 111 were completed as oil wells, and 25 sites were plugged and abandoned. Two reasons for the high ratio of gas to oil wells were 1) the rapid rise in the spot gas prices, and 2) the recent rapid development of coalbed-gas resources in east-central Utah. However, in every year since 1997, completions of gas wells have exceeded oil wells. The Uinta Basin was the most active petroleum province in the state with 453 well completions including 327 gas wells and 126 oil wells. The four most active fields there were Natural Buttes – 160 completions (all gas), Wonsits Valley – 88 completions (79 gas, 9 oil), Monument Butte – 42 completions (all oil), and Red Wash – 13 completions (all oil). Twenty-three gas wells and 18 oil wells were completed in undesignated areas near existing fields, and 12 wells were completed as wildcats (all gas). The province with the second highest level of drilling activity was the coalbed-gas area that includes the Castlegate, Helper, Drunkards Wash, and Buzzard Bench fields. Exploration for coalbed gas in 2001 resulted in 146 new wells, bringing the total number of producing gas wells to 490. The majority of well completions were in the Drunkards Wash field (110), followed by the Helper field (15), Castlegate field (7), Buzzard Bench field (4), and 10 other wells in undesignated areas nearby. Drilling began on seven new wells in the Thrust Belt province, and one prolific gas well was completed in the southern part of Wyoming’s Yellow Creek field, which trends southwest of Evanston, Wyoming and is partly located in Utah. This particular well was actually a re-drill of a well originally completed in 1997, and while the site’s surface facilities are located in Utah, the lower, producing interval of the well is located in Wyoming. Wildcat exploration drilling in Utah was at an all-time low in 2001. Eighteen wildcat wells (all gas) were attempted in 2001, most of which were successful. The wildcat wells were located in the Uinta Basin (12), near the coalbed-gas area (4), and in the Thrust Belt area (2). 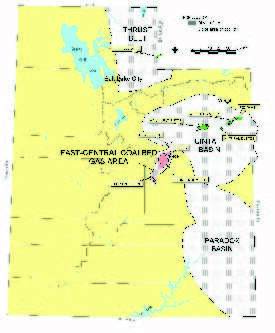 Of the 18 wildcat wells, 6 were completed as shut-in gas wells, 4 in the coalbed-gas area and 2 in the Uinta Basin; 7 were completed as producing gas wells, 6 in the Uinta Basin and 1 in the Thrust Belt area; and 5 wells were plugged and abandoned, 4 in the Uinta Basin and 1 in the Thrust Belt area. The impetus for the high level of petroleum-industry activity in 2001 was the rapid rise in oil and gas prices, which began in mid-1999 and then fell in early 2001. More statistical and individual well data are available on the Division of Oil, Gas and Mining’s web site at http://dogm.nr.state.ut.us/oilgas.